Zerubbabel was the head of the tribe of Judah during the time the Israelites returned to their land after their exile in Babylon. The LORD spoke through the prophet Zechariah that He wanted the temple rebuilt and He chose Zerubbabel to be the one to accomplish this task. However, the LORD made it clear that the task would be completed not by man’s might, nor by any ruler’s power, but by the LORD’s Spirit. The LORD was going to work supernaturally through men to accomplish this rebuilding of the temple. 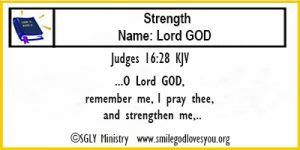 It wouldn’t be done by the strength of men, nor the power of an earthly king, but by the LORD. Yes, men would have to co-operate and do the daily tasks but the LORD’s Spirit would lead and guide through the whole process. of our might or power, but because of His. We believer’s have His Spirit dwelling within us. Each day we have the ability to do great things for the LORD in His might and power. So, let’s memorize this verse and daily ask the LORD what it is that He wants us to do for Him, and then go forth to accomplish it by His Spirit. Blessings to you daily as you walk in His Spirit and do the good works He has prepared for you to do for Him. Believers, this verse is a reminder of what we should be doing daily. Everyday we should be looking for and anticipating Christ’s return! Since none of us know the exact date and time, we should always be thinking of it, and preparing for it, so we will be ready when His glorious appearing comes! Let’s memorize this verse as a reminder to us to always be looking for His return. Blessings to you as you look for that blessed hope daily! So in various trials we should stay in an attitude of thankfulness that we have God to lean on, we should trust that He is aware of our circumstances, we should believe that He is working things out on our behalf. 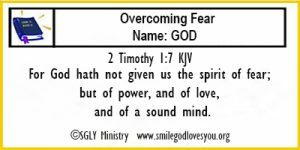 Staying in this attitude will keep us from discouragement, grumbling, anger and worry, which are all forms of unbelief and therefore sinful on our part. This week then as we memorize our verse, let’s give thanks daily and also put into practice the verses before and after it. 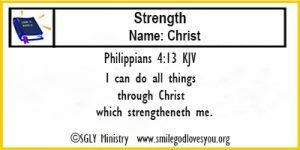 f you would like you can Print the memory verse out in a card format to post to your bathroom mirror, refrigerator, car visor, or other place that would keep it in your daily vision. Blessings to all of you daily in Christ Jesus our Lord. I chose this weeks verse because it reminds me of a time in the future when I am going to be going into God’s Kingdom in heaven where Jesus will be waiting to take me to dine at His Marriage Supper of the Lamb as spoken of in Revelation 19:6-9. I am not sure if this weeks verse is referring to that time or if it is just a reminder to me, but I think it could be and I know there will be such a time for me for God’s word says so. Therefore, it seems to be a great, encouraging verse to memorize. 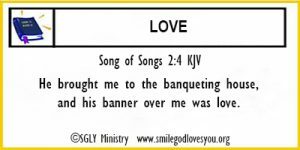 The book Song of Songs does not specifically mention the name of God, Lord, or Christ, however there are several verses in it that I think make reference to one of those names and this verse is one of those. I hope you will join me in memorizing this scripture this week and that you are as encouraged by it as I am. Blessings to you this week as you rest in His love and look forward to a great time in the future in His Kingdom. 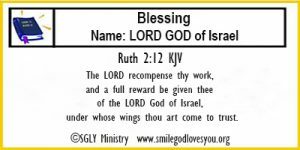 In this weeks verse we hear a very grateful David praising God for who He is and for all He has done for David and for the people of Israel. God has just spoken to David through the prophet Nathan of how He has blessed David and will continue to bless David’s seed after him and will establish Davids throne and kingdom forever. As God was with David all his days, so He is with us. And, as God blessed David so He blesses us also. So, let’s memorize this verse and speak it out from our heart to God daily as a wonderful prayer of praise to Him! Well isn’t this week’s verse a powerful one! The Lord is telling us just who He is! 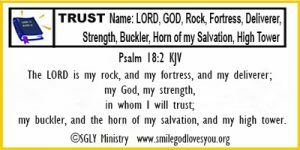 The Almighty–past, present, future. He is with us now as He was with us yesterday and will be with us tomorrow and always. What great assurance this verse should give us daily as we walk through this world! Just saying it out loud to ourselves everyday can bring us encouragement, for it is a powerful verse that declares to all just who God is. 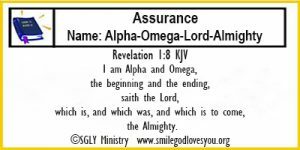 So, let’s memorize this verse, share it with others, and give thanks and praise to our Almighty God, Omnipotent Ruler, Lord of All, who is the Alpha and Omega. Blessings to you as you memorize, declare, and share His word this week. This Week’s Memory Verse reminds us to give thanks for and continually pray for our brothers and sisters in the Lord. and our fellow believers who are friends or co-workers. 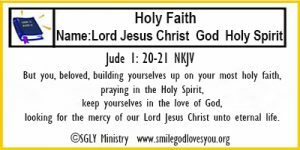 Let’s remember to pray for those who are in prison for their work for the Lord or those who are being persecuted for their faith. This week just take time to remember, give thanks and pray for all those you know who are fellow believers. 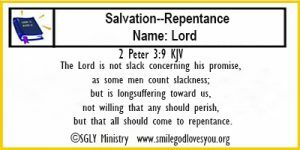 The Lord is not slack concerning his promise, as some men count slackness; but is longsuffering toward us, not willing that any should perish, but that all should come to repentance. 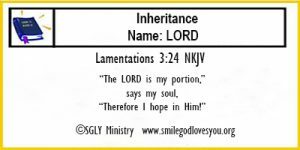 The Lord is not slack concerning his promise—the Lord has promised there will be a time that Christ will return and there will be a day of judgement–He has an appointed time that this will happen and it will happen at that time, not sooner–not later. 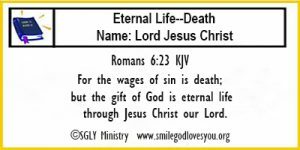 want anyone to perish (die in sin) but He wants all people to repent and come to be saved. He set the time long ago to give everyone a chance for salvation but when that time arrives He will not extend it. No one should wait to repent of their sins and accept Christ as their Savior, because no one knows how much time they have. Memorize this verse and share it with those you know who are lost, let them know that they need to repent and believe and receive Christ now before it is too late. 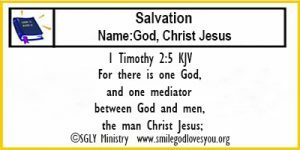 The Bible’s New Living Translation says it this way: Christ suffered for our sins once for all time. He never sinned, but he died for sinners to bring you safely home to God. He suffered physical death, but he was raised to life in the Spirit. Believers, we know that Christ has brought us to God and He has given us new life in the Spirit, this verse explains it very well. 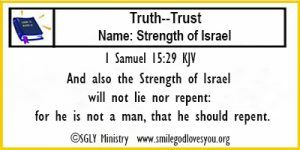 Let’s memorize this verse and use it to share with those who don’t know this and this is another Trinity verse that we can share also. As you memorize and share this week, also remember to praise Christ for what He did to bring us to God and give thanks for His Spirit who has also quickened us to new life in Him for all eternity. 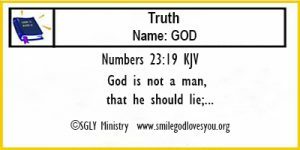 God is not a man, that he should lie;…. This Week’s verse is short, but powerful. God is telling us that He does not lie. And, we as believers all believe that in our hearts, and we know that in our minds, but…. there are times when we let doubt creep in, or fear, or insecurity. We wonder about this or that regarding a situation instead of just believing and trusting. Memorize this verse–Speak it out loud to yourself whenever you doubt or fear or are tempted. Know that God’s word is always true and that He will always keep His promises. Blessings to you daily as you memorize His word and live in His love and care. In this chapter of Nehemiah we see the children of Israel fasting, praying, repenting and worshipping the Lord. They are reading His word and declaring who He is. They are recalling His wondrous deeds to their forefathers and His love and care for all generations. 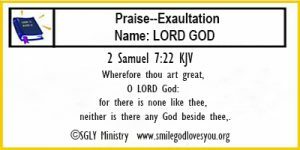 They are praising His name as LORD, God, One who is forgiving, gracious, merciful, slow to anger and of great kindness. This week as we memorize this verse let’s also take time to worship and praise Him, our God, who has all those attributes and more. Let’s make this week’s memory verse into a prayer of praise to Him, declaring that He is our God who is ready to pardon, gracious and merciful, slow to anger, and of great kindness. How blessed our week will be as we do this daily! What does God want? 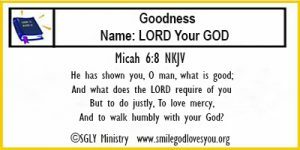 Goodness, Mercy, Love, Justice and a Relationship with you. This Week’s verse shows us pretty plainly how the LORD wants us to live. He wants us to be fully committed to Him and walk humbly with Him daily. He wants us to be upright in all our daily doings. He wants us to be merciful towards others as He has been merciful towards us. He wants us to do good, be kind, loving, exhibiting the fruit of the Spirit in our lives. When you think about it, what He is requiring of us is no more than He has done. He is not asking much of us, He just wants us to have a close personal relationship with Him, one in which we love Him as He loves us. If we do this our lives will be good, spiritually rich, and full of blessings. Memorize this verse to remind yourself daily how the LORD wants you to live. Blessings to you daily as you memorize His wonderful word! 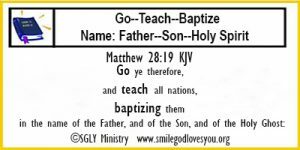 Believers, before Jesus left this earth He instructed His followers to go, teach, and baptize–all nations. He said to teach the nations to observe all the things He had commanded. I guess if that is our purpose in life, then we should know what He had commanded, therefore we need to be reading and studying the gospels to learn what Jesus taught His followers and then we need to ask Him out how we can share that with others today. This is not something Jesus said lightly, this is a command to us, His followers, to do. This week as we memorize this verse let’s really think upon it and make plans to act upon it also. God’s blessings upon you this week as you memorize, ponder and pray. 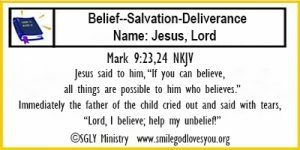 To call Jesus, Lord, was to acknowledge that he did believe and receive Him as Lord and Savior, then he asks for forgiveness by saying “help my unbelief” which could be interpreted as forgive me for my lack of faith. 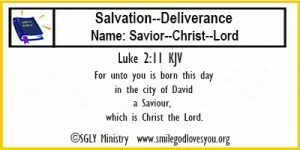 A great thing happened that day for both the man and his son received healing and deliverance! Memorize this verse and think upon it this week. 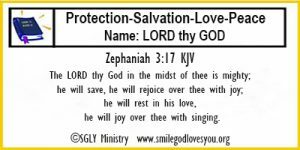 Give thanks that you know Jesus as Lord. Give thanks that “all things are possible to him who believes” and if you have any unbelief, ask Jesus to remove it from you. 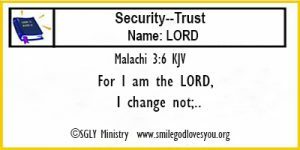 “For I am the LORD, I change not”, a comforting statement to us believers. It tells us we have put our faith in someone we can trust. 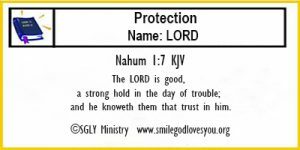 We can rest assured what whatever the LORD has said is something we can count on.. We can rely on His promises and count on Him to always be there for us day or night. We have no need to fear for He will do as He has said, for nothing He has spoken will ever change. What a blessing it is to be His children and live in His love! Memorize this verse and keep it in your mind daily to remind yourself that you belong to someone you can trust forever! In this ever changing world we live in it is such a comfort to know that our LORD never changes. ever they journeyed. He would bless them and provide for them. They would have a close personal relationship with each other. The choice was theirs, Him or the World, unfortunately their fleshly desires always seemed to lead them astray and they were never able to obey. 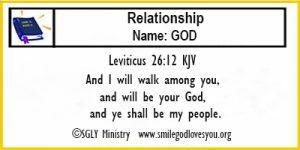 That is why Christ had to come to fulfill the Law and bring those who believe in Him into a right relationship with God. 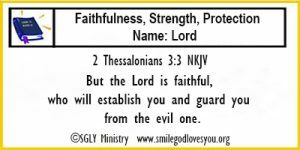 To me, this verse seems to be the promise of of what we believers have in Christ, for His Holy Spirit lives within us and is with us always and in Christ we can have a close personal relationship with God and receive His many blessings, peace, protection, and provision. So, let’s memorize this beautiful, encouraging verse this week. Let’s give thanks that we are God’s people and that His Spirit dwells within us because of Christ. Then, let’s walk and talk with God daily as His people. 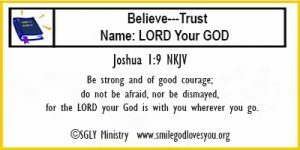 Three times the LORD told Joshua to be strong and of good courage. Moses had just died and Joshua was to take over leading the people of Israel. The LORD knew Joshua would be feeling unsure, perhaps a bit frightened at this great task. The LORD wanted to ensure Joshua that he could do this because the LORD Himself was going to be with him night and day where ever he was, the LORD would be there helping him, telling him what to do. And so, as Joshua believed, and trusted, he led the people as the LORD told him and he saw the power of the LORD come to pass. 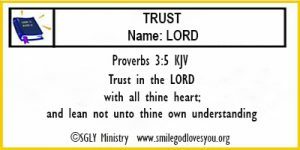 but to trust Him in all things. As we believe Him and do as He says we see His hand at work in our lives just as Joshua did. Memorize this verse as a reminder to be strong, be courageous, and to not be afraid or dismayed, for if you are a believer, the LORD your God is with you wherever you go.